In a recent article by Jan DeGrass for the Coast Reporter, DeGrass reviews Marina Sonkina’s Expulsion alongside Bonnie Reilly Schmidt’s Silenced: The Untold Fight for Equality in the RCMP as two books about “women who strive to make a difference, to save what is good, to state what is honest”. “Many of the tales in this new fiction collection…recall the women of Moscow who strive to make a living or simply to survive. There’s naïve Inna whose honest execution of her duties is not what the boss wants. And there’s a nameless wife who is lonely even though she lives in a communal apartment in Moscow with a listless husband, nasty neighbours and active bedbugs. In another story, Tanya seeks a miracle to make her wandering husband love her again, so she becomes baptized, not a politically correct activity in the Soviet Union. She pays heavily for defending another man who has also found religion. 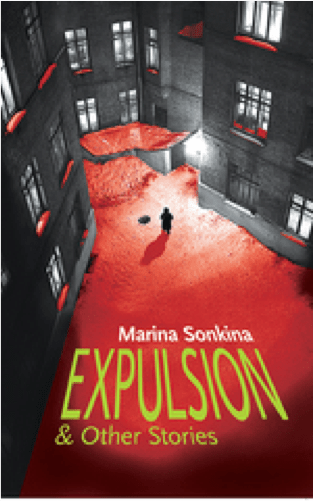 In the title story, Expulsion, young Alexandra strives to learn math and earn respect, until she meets a lewd gypsy”. Ending her review by praising Sonkina’s story “Face”, DeGrass explains, “Sonkina’s characters inevitably gallop to surreal disaster, yet they are the backbone of her tragicomic stories”. Expulsion & Other Stories consists of two parts: a novella followed by a group of short stories. But the main protagonists have one thing in common: they are all women coming of age in difficult times. Nobody spells out the rules of survival to the young girls and women, yet each learns to play – or pays the price, that of facing “expulsion”. Marina Sonkina was a teacher of literature and linguistics at Moscow State University until she escaped to Canada, where she worked as a CBC producer, broadcaster, documentary film researcher, and translator. She taught humanities at Dawson and Vanier College in Montreal and now shares her time between teaching at Simon Fraser University and the University of British Columbia as well as writing. She has published two collections of short stories and two children’s books. Tagged with Coast Reporter, Expulsion, Jan DeGrass, Marina Sonkina.